An urbex trip to Belgium, to the Nation of Ruins! This was on top of my checklist! The time was after a relaxing holiday in France and before returning to work in Japan. We spent four nice days discovering the dark side of Belgium. This first article will focus on the industrial sites, while the second be more about the residential areas. We start with the University of Val-Benoit, the ruin that is the least “industrial” in this article. It is located in the centre of de Lièges, and a guard patrols there. How nice! There were endless corridors, a tremendous number of classrooms, laboratories and machine rooms. One can easily spend days there and not be able to see everything. 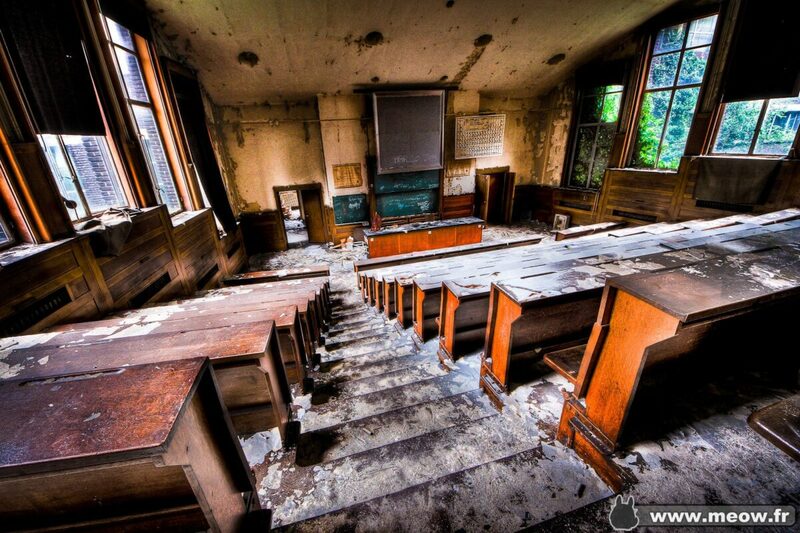 The university dates back in the 1930s and has actually been abandoned for 6 years. However, it should be renewed shortly and let to different companies; the reason why it is being protected. The secret goal of this expedition was to find this lecture room, but in fact, there were more than one if them, all of which being equally grand. Unfortunately, we had to run away not long after, chased by a guard rather agitated. But it is not a problem, the ruins are everywhere in Belgium! Next destination, ECVB. A power plant of 50 years old. An atmosphere of hell. The place has the good old smell of asbestos and rusty metal. It is really better to shut all our senses, leaving only the eyes. Standing inside the control room, we were dropped directly in the middle of the post-apocalyptique world. And the silence… From time to time, a drop of water resonates infinitely within the metallic body of the factory, then a electric thrill will strike through my spine. Cockerill. This is the name that marked the industrialization of Belgium, who has abandoned belgium for good. This name haunts all abandoned industrial sites in Belgium. He is everywhere, ubik at will. If there is any ghost in those abandoned sites, it will be the ghost of Cockerill for sure. The heart of the power plant, the generator! And that’s where our beloved electricity came from. Note the chair placed above (which I doubt will hold a second if everything was in use). An explorer probably wanted to play the Paul Muad’Dib, perched up high on his heavy-metal worm! The exploration of the power plant, however, has ended badly: with no battery left! It was therefore impossible to take more pictures. Suppose I was not ready to be a photographer just yet. So basically I had to leave the power plant to charge my battery (in a bar of the countryside, along with some Belgian beer). Then next destination, a cemetery. 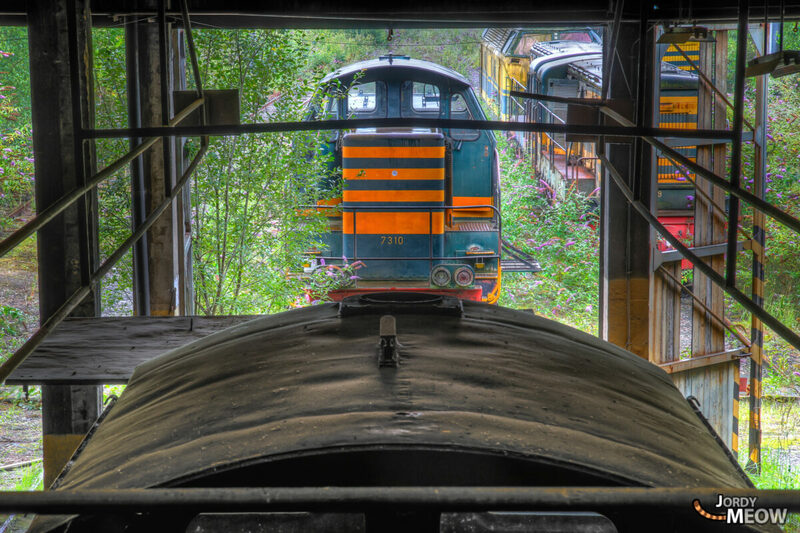 Very special one, because it is a cemetery used by the SNCB (Belgian National Society of Railways) to abandon its trains. We again have encountered the ghost of Cockerill, who had probably designed most of the trains here (especially those who have had problems running …mysterious!). Back in the bushes. It is worth mentioning that the cemetery of the SNCB is very well protected by the heavy greens! We now move on to another power plant, but this time much more modern than ECVB. We will be able to appreciate the difference. We start with the view from the roof, which provided an outlook of the cooling tower. 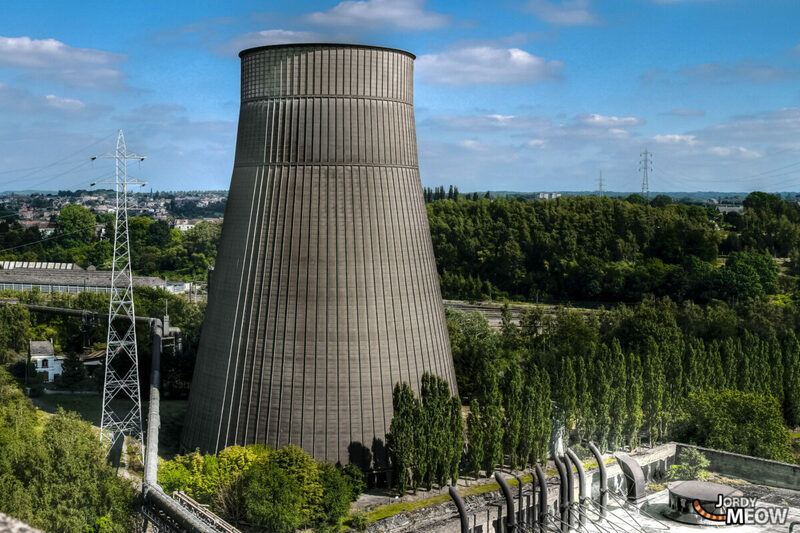 These tours always remind me of nuclear power plants, which as a result generated a little stress, together with some dizziness equals a very good mix of emotions. The interior of the power plant is stunning. Unlike the ECVB which is very colorful, there were large windows here allowing the light to shine hence to exaggerate the size of the place. This plant is a relatively new discovery, and despite the grandness of the place, it was simply called Power Plant IM. One could spend hours gazing at this monster of metal …gazing at the finess of its piping, the curled up shower heads, the tubes with the stripes of the snakes and the orange carapace with its multiple legs attached to the ground … The monster seems ready to relax its muscles then leap over to grab our necks. Then I stop at the door of the control room. But … there was someone in there!? A person with a khaki coat was lying on a chair! I had another closer look, but the person seems completely dead. We then left to returned with more people, only to find out that it is just a coat. The shadow and lighting effect has obviously deceived our eyes. We finally left this beautiful power plant to visit the Bonneterie Victoria. Access to that was rather difficult (thorns everywhere leading to a very high window only half opened), but the retro-futuristic machines in it are well suited for photography. So much for the industrial ruins of Belgium. The next article will show a different side of urbex, less aggressive, less metal, but more gentle and melancholy. Closer to us.